The Land Rover Discovery Sport combines the looks of the big Range Rover SUVs at a price closer to the Evoque. This alone will do wonders for the brand and we won't be surprised to see the Discovery Sport become one of the best selling products in JLR's current line-up. But when examined more closely, the Discovery Sport is quite the unique proposition at its price point of Rs 46-62 lakh. It's the only car in the segment to offer seven seats but it is also one of the most compact, both in terms of length and wheelbase - some very clever packaging there from JLR. Then we come to the powertrain. The 2.2-litre four cylinder turbo diesel is available in two forms - 150PS and 190PS respectively. The base 150PS TD4 is available in all but the most expensive HSE Luxury trim. This means that unless you fork out a minimum of Rs 60 lakh ex-showroom Mumbai (which translates to over Rs 70 lakh on road) you will only get the lower powered 150PS engine. That's quite a bit less than the competition, especially the BMW X3 which also offers a potent 258PS straight-six turbo diesel for less money than the top Disco Sport trims! On the plus side, all Discovery Sports will come with Land Rover's famed Terrain Response system which means that no matter the trim, this will probably be a capable off-roader. It is still a Haldex based all-wheel drive system like in the Audi Q5 so don't go expecting the same level of ability as the top Range Rovers that have full-time 4WD with low ratio capability. Feature wise, the Disco Sport has quite the list, however, most of the good stuff like the adjustable dampers, adaptive xenon lamps, Meridian audio system, rear seat entertainment package is only available on the top variant. The entry level S TD4 has precious little and comes with manually adjustable fabric seats and halogen lights. There's no cruise control, auto dimming interior mirror or dual zone climate control. It's best worth skipping this model and considering either the HSE or HSE Luxury. 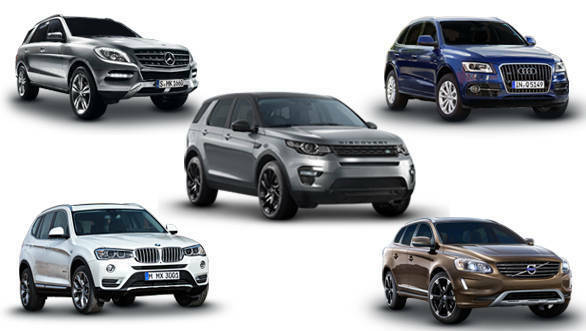 At this price point, the Discovery Sport competes with the Audi Q5, BMW X3, Mercedes-Benz M-Class, Volvo XC60 and also its stylish but smaller sibling, the Range Rover Evoque. It goes head to head with the Audi, BMW and Volvo in terms of size but all three are priced a little lower. The Mercedes is bigger and comes with the most powerful motors although the top V6 diesel does command a premium. For someone who isn't bothered with space and practicality the handsome Evoque makes another compelling case from the JLR stable.